Children playing during a Point Parent and Toddler get-together. 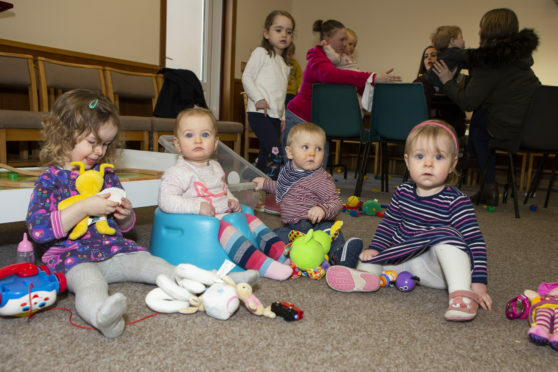 A parent and toddler group in the Western Isles is celebrating after receiving funding from a community wind farm project to help aid the group combat isolation and postnatal depression. The Point Parent and Toddler Group have been praised for the support it gives for parents and toddlers, impacting the mental health and wellbeing of those who attend. The £300 grant from the Point and Sandwick trust is set to allow the group to continue operating out of the Garrabost Free Church on Friday afternoons. One mum who said the group had made a huge difference to her wellbeing was Elsie Thomson. Elsie, who also lives in Garrabost, is mum to John, two and a half, and Thomas, seven months, as well as to 14-year-old Stephen, whom she is homeschooling. Around 45 children are registered at the group, however, do not attend every week. The group was set up nine years ago, but has seen a major boom in the past two years as more families have signed up. The group is open to all with drop-ins welcomed at the Garrabost Free Church every Friday between 1pm and 3pm.